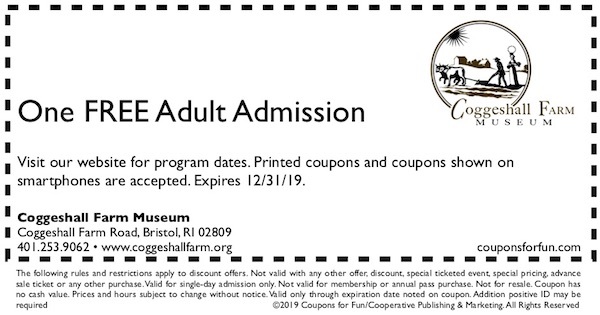 Coggeshall Farm Museum in Bristol, Rhode Island - Get savings coupon! Prepare to get your hands dirty exploring the lives of ordinary tenant farmers living on the edge in 1799. Meet rare-breed livestock, tend heirloom vegetables, and explore 48 acres of fields, woods, and salt marsh. Time doesn't stand still around here. As the weather and seasons change, so too does the work, following a continuous cycle of birth, raising, and eventual harvest. Visitors to the museum encounter a New England farm at work in the years following one revolution—the war that brought independence from Great Britain—and leading up to a second—the Industrial Revolution. On the cusp of major social and technological change this revolution would usher in new ways of understanding agriculture and the world.